media during a news conference at the White House on Friday. The Wall Street Journal just published a story on it and I totally missed it but apparently Bill Clinton paired up with the Obamanation in a press conference today. Strange, right? Well it doesn't stop there. 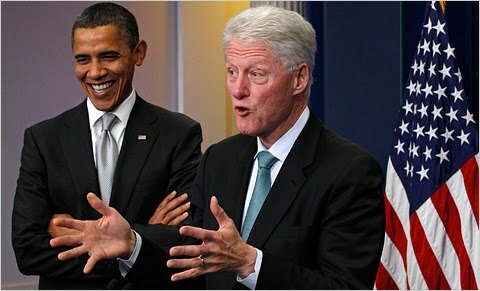 Both of them spoke, Clinton took the podium and the weirdest thing happened.....Obama walked out the back door and Bill Clinton took over the White House press conference. Bubba defended the Child-Emperor's Bush tax rate extension as the current president ostensibly fiddled his thumbs (or played basketball) in a different room, down the hall, outside - who knows, perhaps Clinton is just reverting to a previous opinion on Obama. I don't have video of this but will post it as soon as I get my grubby little fingers on it. I saw a President who, for a few minutes a least, ceded his job to his predecessor. He’d failed to sell his own policy, so he needed and got some rescue from Clinton. This was the third press appearance President Obama has made this week, and it was far and away the weirdest presidential press briefing I’ve ever seen. Where Obama goes from here is anyone’s guess. Real Clear Politics has video of the spectacle. Obama actually interrupts Clinton delivering an answer, to say his bit about keeping the First Lady waiting, before hitting the exit. Clinton says “I don’t want to make her mad, just go” and waves POTUS on his way without missing a beat and continues with the presser. I'm going to check out that video. In the comments reader John notes that we have possibly entered the third term of the Presidency of Bill Clinton. In comparison to the last two years, that would be a dream. 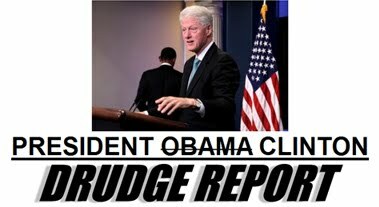 Updated x2: Allahpundit echoes LCR, "Great news: Bill Clinton Apparently now president again." I can’t do justice to what you’re about to see. The spectacle of the president bugging out of his own press conference to go to a Christmas party is weird enough, but having Clinton back at the White House podium fielding questions on the hottest domestic issue of the day shoots past deja vu and lands firmly in “am I hallucinating?” territory. Thanks to Left Coast Rebel, here’s YouTube of the moment the Obama presidency (may have) died. Updated x6: The entire press conference can be seen at C-Span. I'm watching it right now. "Sorry but I can't lead the nation right now... my wife is calling"
So then, can we say this is Bill's third term? The Boy President gave up and went home. Hilliary, you must remember this; Bill is the greater whore. Where have you been? It's always about Bill. Hill, go home; clean the oven; take the heat. He's the much bigger whore. He helped drop kick youto the curb. Sorry honey, but you lost. Indeed, indeed, indeed... To all the above comments! Well, one good thing will come of this. I rather listen to slick Willie, than false hope and change any day. However not by much. Slick Willie just sounds better when he's BSing us and at least everyone knows what he is. That Drudge photo may be the image of the year. The job is clearly too big for Obama. Mr. President! Mr. President....Iranian missiles are approaching Washington and New York...what should be done? Sorry Guys, first lady is waiting, dinner is getting cold....I have to run.